Dod Procter often painted subjects that other artists overlooked such as children, flowers and domestic scenes. The setting for The Quiet Hour is the kitchen of Dod’s former home at Myrtle Cottage in Newlyn, Cornwall. The Welsh dresser in the painting is decorated with various pieces of china which Dod was fond of collecting and would often decorate herself. The young girl in the painting is Polly Walker, daughter of a local artist and friend of Dod’s. This kitchen scene can be found in many of Dod’s work such as Kitchen at Myrtle Cottage (c.1935), in which Polly also appears, which is in Tate’s Collection. Dod was influenced by the Impressionists particularly Renoir, and later critics would call her our own ‘English Renoir’. The style of the Impressionists is reflected in this painting with its use of light and colour. 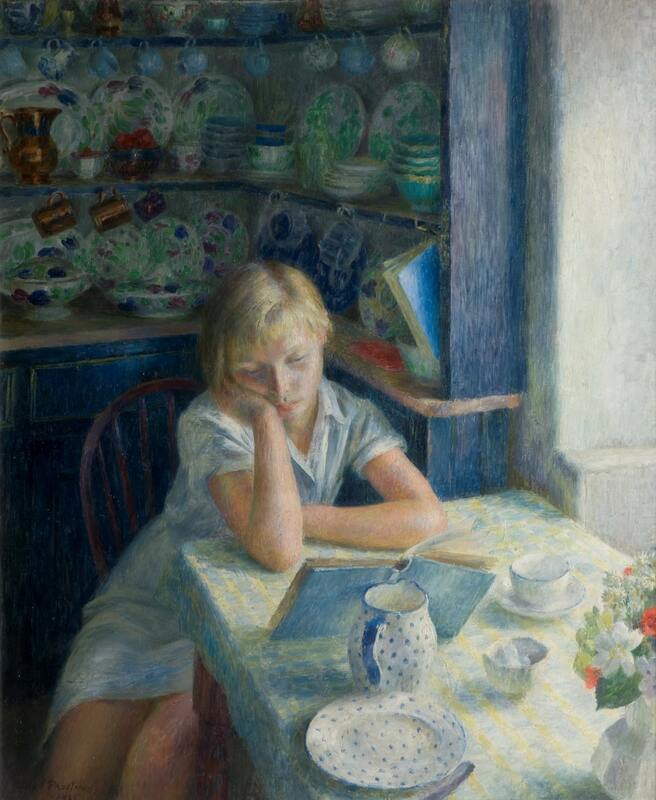 Dod Procter was born Doris Shaw in 1892 in the middle class area of Tavistock. She was called Dod for short and continued to use the name all her life as she enjoyed its ambiguity. After her father’s death in 1907 the family moved to the thriving art colony in Newlyn, Cornwall; it was here that Dod at the age of 15 enrolled in Stanhope Forbes’ School of Painting. The Newlyn Art Group became known for their depiction of the local fisherman and their families, capturing the harsh realities of their lives, not a romanticised view. In 1912 Dod married another Newlyn artist, Ernest Procter, and they travelled to many exotic places together, such as Africa and the West Indies; painting many of the local people in their vibrant costumes. Dod also enjoyed painting flowers and scenes from her garden; she applied the same sculptural quality to her flowers has she did to her figure paintings. Her travels abroad also encouraged her to paint many exotic flowers. In 1935, Ernest died at the age of 49. Dod’s work then began to change; her paintings became hazier with a softer focus, this is reflected in her work called Spring Flowers which is also currently on display in the collection galleries as part of the People’s Choice exhibition. Dod’s work achieved great success; she became a Royal Academician in 1962. She was often described as a real character, eccentric, stubborn and always enjoyed being the centre of attention. She had long legs, short black bobbed hair, dark eyes and brilliant skin. Hannah Gluckstein described her as “having great charm, a keen sense of humour and always ready for an adventure”. Dod’s work began to slip in to obscurity as public taste began to change. However, she still carried on showing her work at The Royal Academy every year, where she was fondly remembered as always wearing her famous black Spanish hat. She died in 1972 at the age of 82. The Quiet Hour is one of my favourite works in the Permanent Collection. The young girl looks so quiet and content just reading her book, which is something that I often do myself. I love the way the light picks out all the different colours in the painting, from the yellows in the table cloth to the blues and pinks in the young girl’s hair. The kitchen scene feels so homely and comforting; I could easily see this hanging on my own kitchen wall.